Life Hacks have published a great article entitled Let’s End Networking, Please, bemoaning the now cringe-worthy excess of networking events. It’s a great antidote to the growing number of networking events in every industry even down to university, and argues that these events are now too cold and “explicitly manipulative”, where people only connect to get something they want, rather than building relationships. Allen Gannet who writes the article says we cut ourselves short by only taking what we need from networking and that ‘we create a false barrier that prevents connecting with them personally’. While he doesn’t draw the link explicitly I’d say Twitter and other open social media may be both the cause and potential antidote to this situation. On the one hand it has never been easier to ‘make a connection’. With LinkedIn you could give someone only a one line reason to connect and bingo you’re in. Talk about not building a relationship. On the other hand, there is a lot of talk about separating your personal and professional life on Twitter. I’ve always felt uneasy about this, and maybe this article explains why. If we maintain one universal persona on social networks we might achieve what Gannet is calling for, by communicated and networking with people with your own genuine voice. Interestingly,when I try and explain social networking to anyone who wants to use it professionally, I always encourage them to maintain one account but to think of it like networking, in the sense that of course you’re going to be professional, and of course much of what you talk about will be related to your given industry. But also that, in the sense of the type of networking Gannet is calling for, you will also be friends with that person, you will ask how their family is, you’ll joke about the state of TV at the moment, you’ll admire their dress. In really good, and let’s admit it, really effective networking all this happens. So why not on Twitter? And to bring it full circle, many people DO already recognise this and do this on Twitter, so maybe its time we brought it back to face to face networking too. This reminded me of one of the 10 commandments in the classic business book What they don’t teach you at Harvard Business School which says “You can never have too many friends in business.” Maybe it’s time to bring back that warmth. A few weekend’s ago I visited the National Computer Museumm near Milton Keynes. I was intrigued because of the history of the place, and Alan Turing’s northern links, and because I’d just written an article about computing in schools. Our tour finished in a room full of BBC Micros and some very knowledgeable volunteers. Here are some of the best bits (I’ll try and cover everything in future posts). The UK has a ridiculous amount of computing history: The Acorn chip, which was made in the UK is the basis of most modern phones and almost half of today’s broadband. Opensource embroidery: Talk about cross medium. 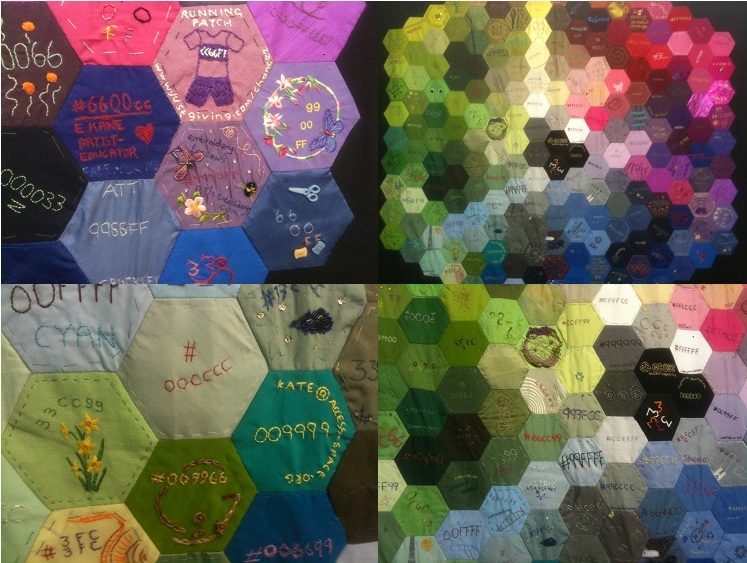 Ele Carpenter led a project to create a HTML patchwork using websafe colour codes. What I love about this is the whole taking computing beyond just a screen and trying to get people involved through completely different mediums. Kids programming: What really blew me away was the amount of computing literature for kids that was published around the time of the BBC Micro in the 80s. Below are just a few snaps I took of all the books the museum have saved. They were also screening daytime and kids TV shows that used to explain how to do basic programming. Where has this gone?! My favourite was a programming magazine for children called ‘Let’s Compute’, mainly because the boy and I have talked about mocking up a magazine like this for the present day. While there I had the pleasure of talking to a number of volunteers including Chris Monk, who is working on museum plans to do more evening, weekend and holiday workshops for kids. He told me they would probably start people off on the BBC Micros they have and then move people on to Arduino and Rasberry Pi. Considering how difficult it still is for teachers to get programming onto the curriculum, it seems like an amazing opportunity for young people to learn these skills at least in an extra-curricular way. If you want more info on the museum, ICT teacher Alan O’Donohoe has some fab videos and insights here, and the official website of the museum is here. Pretend like you’re back in Jane Austen’s England and take this personality quiz to see which of the Sense & Sensibility Dashwood sisters you would most be like! I originally created this quiz for a magazine version of Jane Austen’s Sense and Sensibility, a PDF of which can be found on the ‘In Print‘ tab (or read through it below) but I wanted to update it so everyone could take the quiz online. It’s a bit of fun for Austen lovers, but also maybe a good resource for getting teens into reading her novels? Take the Sense & Sensibility quiz on Quibblo here. Is Twitter replacing Email for marketing updates and offers? If, like me, you use twitter all the time – could it be a better way of recieving news and offers from your favourite brands instead of email? And if so, what does this mean for online marketing streategies? I recently had a clear out of my email inbox and made an interesting decision based on how I consume marketing from my favourite brands. I am lucky in that I don’t recieve too much junk mail, but I still get about 5 emails an hour from various social networking sites updating me, and shops and brands that I have chosen to receive emails from. But I never read these emails. Ever. Even though I’ve opted in for them. So I settled on two solutions… iPhone notifcations, and Twitter. With the OS5 update, push notifications are now super effective on the iPhone. Most importantly they don’t get lost, so if you have 10 come through at once you can still look at them all. Because of this, I’ve now cancelled all email notifcations I receive from Facebook, Twitter and Linked In, and set them up on my phone instead. I want updates from certain brands – The Body Shop, Mountain Warehouse, Little Pink Book etc. Sometimes it’s to know when sales or offers are on. Others are newsletters that I want to keep updated with but often don’t have time to read. The problem is, there are that extra few clicks to get into an email (especially if you want to see the pictures). Plus the fact that it remains there until you delete it (another few click). Tweets however, stay there but aren’t your responsibility to delete. Plus, if you look at Twitter often then there’s no extra clicking through. So I unsubscribed from all my email updates, made sure I followed them all on Twitter, then made special lists for ‘Offers’ and ‘Newsletters’. I now can browse these when I have time, and especially with the offers, when I actually want to buy something. It has already worked – I used to receive Mountain Warehouse emails all the time, with the latest discounts. However, the subject line often wasn’t long enough to get to the point of the offer. Plus I wouldn’t make the click through. One week later, after my email purge, one of their offers caught my eye as I was scrolling through Twitter. I noticed it because the whole offer was contained in the one tweet. And just by one click I was through to the full website page compete with all the pictures and information. (Not adapted and condensed for an email which assumes/hopes for click throughs). I may be rare in finding all the above a more effective way of being updated. But if not, this shift in how we consume marketing could have massive implications for online marketing strategies. It is often said that it is bizarre how email is one of the oldest features of the internet, and yet despite the massive changes over the past 20 years, the structure of email has barely changed. Does this mean email updates and newsletters will become obsolete? I doubt it mainly because I think it still comes down to how people prefer to consume the information – I think companies need to give people all the options. And I would argue they need to standardise these options so that people can choose their prefered method of communication safe in the knowlege that they won’t miss out by not receiving information in another way. This also has implications for the people who criticize companies who use Twitter purely for marketing. Because, to be blunt, I don’t care about who’s made cupcakes in the Mountain Warehouse marketing office today. I just want to know the offers in my local shop or online. Maybe that means companies need two separate Twitters? I’ve always seen social media as comunication and not marketing anyway. So why not have one twitter for your communication and PR – to chat to your customers, see what they like, give them a sense of the personality of your company, resolve issues. Then have another twitter for purely marketing – to update people on whatever sales, events or news you have. Because I don’t think the latter is unwarranted. If like me, Twitter is now where you go to be informed (as well as communicate) then I’m very happy to see marketing updates from people I have chosen (and that’s perhaps the key word) to follow, rather than recieve a stream of emails that, simply because of how I use email now, I will never read. We know it keeps changing, these are just a few thoughts on how I’ve recently changed the way I interact with marketing. Please comment if you have any thoughts or experiences related to the above! In the first of a series of digital journalism training sessions as part of my MA, I’ve managed to discover some amazing new social networking and online publishing & sharing tools that I either hadn’t heard of or never really thought were relevant. Here’s some of the one’s that stood out in our discussions. The problem with social technology is that there is so so much out there. This is also the great thing about social technology. You can choose what is public and what is private. So you can use Delicious for two completely separate purposes, and even keep it entirely private if you want. The idea of sharing your links actually is quite appealing (hence why I have a links page on this site!) and maybe bookmarking sites are a great tool for keeping them organised. The search function is great… it’s a far more regulated version of google, where people actually have to value something enough to share it, before it will show up in search results. Trunk.ly – Another bookmark service whose attracting feature is that it will automatically aggregate all the links shared by people you follow on Facebook, Twitter or other social networking sites. This is probably very effecient for people who follow people like me – who often share links on Twitter but don’t collect them anywhere. Essentially I guess its a tool for people who want to use a bookmarking search engine when the people you are interested in aren’t on a bookmarking website. My only issue with this is privacy in letting it access your twitter (though the fact that twitter is open anyway probably negates this worry). Ifttt – Long name: ‘If this, then that.’ Essentially an amalgamation of automatic posting tools, this site allows you to set up prompts so that when ‘this’ (a time of day, a post on your blog) happens, then ‘that’ (post to twitter, send an email) happens. My first impressions are that this is an amazing toy, and also that it’s very handy to create any customized automatic postings that you need. However I’m wary of this type of automation because I worry that it takes away the personal, human nature and voice of social networking? I wouldn’t argue that too far though, I don’t think it’s a massive problem. It’s just for the time being I avoid any automatic posting, as I prefer my postings to be more sporadic and natural. As our lecturer pointed out though, the point of these tools is time saving, and I’m fully aware that if things such as my blog became more popular and regular, then automation tool might quickly become invauable. Google Reader – Google Reader was the one site covered that I do already use. Google reader is an RSS feed reader that can collate blogs and any websites with changing content, that you read. It puts them all in one place for you to check for new posts and then usual read within the reader too. On thinking about it, I collate everything on the web using either Google Reader or Twitter. If there is a person or company that interests me then I will first follow them on twitter. If they have an interesting blog or website that I think I’ll regularly keep up with, it will go on my Google Reader. That’s essentially my way of keeping contacts. I rarely even keep a note of websites or email addresses because I know I can go into my twitter contacts and find every person I would be interested in, and follow through to get contact details. I have found Google reader invaluable since I first got into blogs back in 2008, just because it was by far the easiest way to keep up with latest posts. My only qualm still is that I miss a lot of the beautiful designs of some of the blogs I read. I appreciate that you can’t really have both though, and when I have time I still make a visit to the website itself. Tracking sharing – Another interesting question that came out of this lecture was how tools like Google Reader and aggregation sites like Delicious affect user stats and Google Analytics. For example, when I read a blog purely via my Google Reader, does that show up in any way on that person’s Google Analytics or other website stats? And, what are the main tools for tracking click throughs to your site from url shortening services like bit.ly. I’m not fully sure how this works yet but I plan to look into it and report back on my findings and what I think. I appreciate this will have been done to death already, but here’s my first thoughts on Facebook’s announcements at F8 on Thursday. I am interested in people first and foremost so my fascination with social technologies has always been largely about the sociological aspects and how we’re evolving (etc!!). Up until now I had felt that Google Plus‘ influence on Facebook would purely be as a wake up call, creating that tiny little fire of competition that would make Facebook sit up and think ‘We’ve been at this for 7 years and our chat feature still looks like something from the 80s- we’d better get our act together’. That clearly worked. The reason Google+ held no other interest for me was that it is almost exactly the same as the current Facebook, minus all my friends. But in a week or two that might just be what it has going for it. Google+ will stay at is while Facebook changes beyond recognition… (too dramatic?). My point is that for the first time, I considered taking Google+ more seriously because I wasn’t sure I could handle all the new Facebook changes. I’m still undecided. Back when Facebook first gave you the option to download all your information and therefore have easy access to every post you’d ever made, my first reaction was ‘ooo!’; my second reaction, somehow against all my insatiable curious nature, was ‘maybe not right now’. The fact was it kind of terrified me… my generation really does bear it all on Facebook, and a big part of me was happy leaving the past in the past. There will be some (most probably myself included) who will lock down access to past Timeline activity as soon as it becomes open. (I will probably then spend an awful lot of time deciding if and what I want to share). Most won’t lock down. This worries me mainly in terms of Facebook stalking. We all do it. And it hasn’t really mattered all that much because there isn’t all that much we can really see. The whole world has to self-regulate when it comes to social networks, and we haven’t had to do all that much self-regulating (i.e. knowing how far is too far) when there isn’t much information available. But once timeline becomes active, we’re onto a whole new level of potential ‘advanced stalking’. We’re all human and we’re all curious. If information becomes that easily accessible, we’re going to look. But the problem is, we’re not all that qualified to know when to stop, to know what might be too much information. Both in terms of what we share ourselves, and what we look at of other peoples’ pasts. Will lawyers and strategists start to pop up just to help us work out how much we should share? That’s the scariest thing with social technologies, there is no past president of behaviour. This makes it a). hard to know how to act responsibly, and b). very susceptible to people, personal or professional, jumping in to make judgements based on social conventions that existed pre-social technology. On a more practical level regarding the above notes on sharing – there is a massive difference between the few (well 100,000 at my last count on the night) who actually watched, paid attention to and commented on Facebook’s #f8 conference, who like me are already considering how this will affect things and how we are going to edit our profile privacies etc. accordingly… and the millions of Facebook users who just use the damn thing, who don’t know the background of the changes, who don’t really care, and who currently only remember privacy settings when one of those arbitrary ‘your privacy settings have been changed without you knowing, act now!’ chain-statuses come around. People have been getting more savvy recently it’s true, but there are still enough people who I am not friends with, whose profiles are still open (or worse, who have friends of friends settings enabled – which means you have to REALLY trust all of your 400 or however many friends?! )… and in a few weeks time I will be able to read their life story. Another quarry about Timelines… only recently did I realise that what I see as my profile is rarely what others see because of privacy settings on friends photos. For example if a friend has tagged me in their photo but only set the album’s privacy settings to ‘Friends’ that means that any of my friends who are not her friends cannot see said picture (I’m sure it used to be that as long as you were tagged then that photo was available to all you’re friends too – seemed to make more sense – alas the Facebook privacy saga continues). So actually, this whole concept of telling your story through your timeline won’t really work… your timeline will look distorted and incomplete to most everyone but yourself. However, I do think Timeline is one of Facebook’s more thoughtful projects, because it does fit with what Facebook (in my view, feel free to argue) has evolved to be; your private space. (Yes yes nothing on the internet is private, I know, but it’s the closest we’ve got). It’s where I tell my close friends about important things, things that have effected me, are dear to me, and all that… I talk about what I know my close friends and family want to know about me and that’s it. Yes now that even more information will be on there I will be even more wary of who that includes – as Milo Yiannopoulos put it on Twitter: “When this update hits, I will be dramatically slashing the number of people who have access to my Facebook profile.” But that’s okay, because the main people I want to be connected to on Facebook will remain, and I’m happy for them to see my backstory. (I think, might change when I see it all!!). As for social apps (Facebook is linking in applications such as Spotify and The Guardian to automatically post your activity from these sites to your Facebook)… d’you know what? I’ve never really used the ones that have existed so far, and I don’t think I really ever will. Maybe I’m just a cynic?! To me it’s weighing up the cost. It seems like a small novelty (woo I’m listening to this song RIGHT NOW!) in return for complete access to my account by arbitrary businesses and services with no guaranteed data protection. This may be something that works and that I’m comfortable with in 30 years when Facebook people are generally better at security and privacy options (people working on Facebook apps have said that the generic and horrendously encompassing privacy allowances within apps are forced upon the developer just as much as the user, even if they don’t require it). Facebook’s massive strength, the thing that differentiates it most from other networks such as Twitter, is its privacy, and people’s faith in the privacy. I honestly don’t think they can try and break that down without breaking down their USP. Also, a petty annoyance regarding the Spotify app – didn’t MSN Messenger do the whole live ‘what you’re listening to’ almost 10 years ago?! Not that impressive a development in that case. Also, socially, it made more sense with MSN Messenger because, based on 1-to-1 conversations it meant you could see what someone was listening to as you talked to them, and thus could ascertain something of their mood, or have a talking point. It all seems a bit random and irrelevant in the context of a news feed, no? Personally, I have now deleted almost all my social apps on Facebook (none of which I used anyway). It will take a lot to persuade me otherwise. But in all honesty I know I will get on board with the timeline… I love social technology, so when something comes along to make it even prettier… its catnip. To be honest the thing that’s most likely to make me throw my laptop out of the window at the moment is the damn ‘top stories’ news feeds… does ANYONE understand that?! So there are my initial reactions.. it may be ranty and a bit personal, but my generation have been with Facebook the longest and therefore one hopes we have the greatest ability to make sure it doesn’t f**k everything up. Like I say, all social networking is governed by self-regulation and that alone… so here I am, attempting to self-regulate.